Home Schools of Nursing and Midwifery Updates Can I use NABTEB Result for Nursing Admission? See Answer! 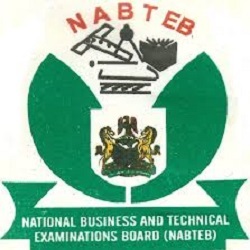 NABTEB holders keep asking if schools of nursing are accepting NABTEB result for admission. In other words, you want to know if one can be offered admission for nursing with NABTEB SSCE result. This post will be my quick guide on this. Generally, NABTEB result is supposed to be acceptable for nursing admission in Nigeria with effect from June 1, 2018. 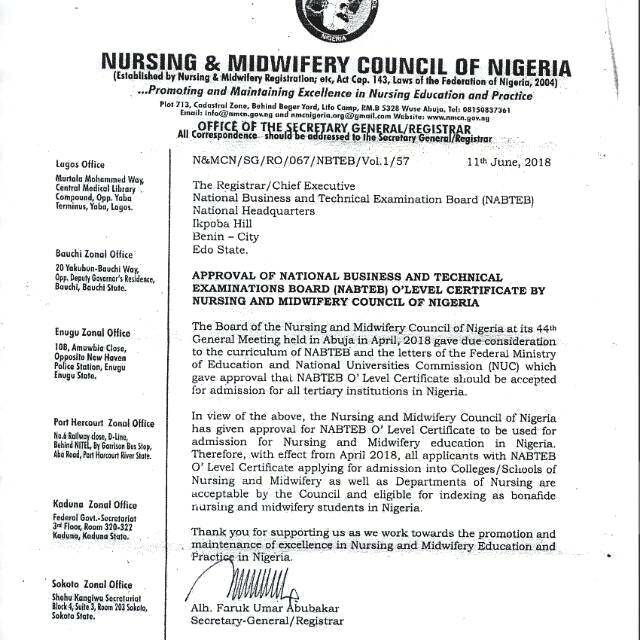 The following is the circular by the Nursing and Midwifery Council of Nigeria with reference number N&MCN/SO/RO/067/NBTEB/Vol.1/57. The circular emphasized that the Board of the Council has given full consideration to the adoption of NABTEB results for Nursing programme admission. Hence, with the effect form that, admission seekers should be confident to present their results for admission into any college or school of nursing in Nigeria. Is Using NABTEB Result For Nursing Admission Really working? The answer is NO, at least not for all the schools of nursing. Not all schools of nursing are accepting NABTEB till date. For examples checking the admission adverts of the following schools, no NABTEB was mentioned as the SSCE entry requirements. As at now, the following schools of nursing indicate that they’re accepting NABTEB. Are Universities Accepting NABTEB for Nursing Admission? Another thing to look at is; can some use NABTEB for university Nursing (Bsc Nursing) admission? I had covered this in my recent post. But to save time, NO! Even though the circular above is enforcing the schools and colleges of nursing to accept the results, no where it mandated the universities offering degree nursing to do the same. In other words, even if colleges and schools of nursing should abide by this directive sooner, I'm not sure that will happen to any university any time soon. A related situation is; if you gain your nursing admission with NABTEB but now wish to proceed to university through Direct entry admission, can you be offered admission with the same SSCE result? This situation is new. But to prepare your mind, it may all depends on the receiving university's admission policy and waivers terms. In other words, schools that give value to your registered nursing certificate as the basis for the direct entry admission may accept it with the NABTEB it was placed on. Schools that gives more value to O'level or both, may deprive you admission eventually. We may be of the view that, it may take awhile before all nursing schools will be accepting it for admission. The circular as the time of this post, is just about two years old. Though NABTEB will need to, beyond the circular, make this possible. They will need some enforcement mechanisms in place. Admission seekers should carefully read the school’s sales of form adverts to check if they’ve also adopted the use of NABTEB any time sooner.